Providing comfort and compassion beyond your lifetime. When Cyril and Claudia Garvey lost their 13-year-old son to leukemia, they made the choice to honor Kevin’s life by opening Kevin Guest House. His legacy is vibrant, bringing hope to our guests each day. The Cyril and Claudia Garvey Society recognizes donors who, like the Garveys, have a vision of caring for their neighbors well beyond their lifetime. There are many ways to make a gift. You can help the next generation of guests to worry less about their finances, and focus more on their health and loved ones. Name us in your will by designating a specific amount, a percentage, or a share of the residue. A transfer of stocks or other securities to Kevin Guest House are accepted securely by our partners at the Community Foundation for Greater Buffalo. 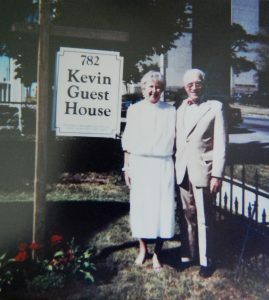 Consider naming Kevin Guest House as the beneficiary of a retirement policy or other financial account. Contribute a life insurance policy you no longer need by designating Kevin Guest House as the beneficiary. We’re here to answer any questions you might have about leaving a legacy gift. We can discuss your particular situation and, together with your attorney and/or financial advisors, find ways to support KGH families while ensuring your own family’s financial security. For questions or more information, contact Pam Chrzanowski at 716-882-1818 or pam@kevinguesthouse.org. The information provided here is not intended as legal or financial advice. Please consult with your attorney and/or financial advisors before making any legal or financial decisions.